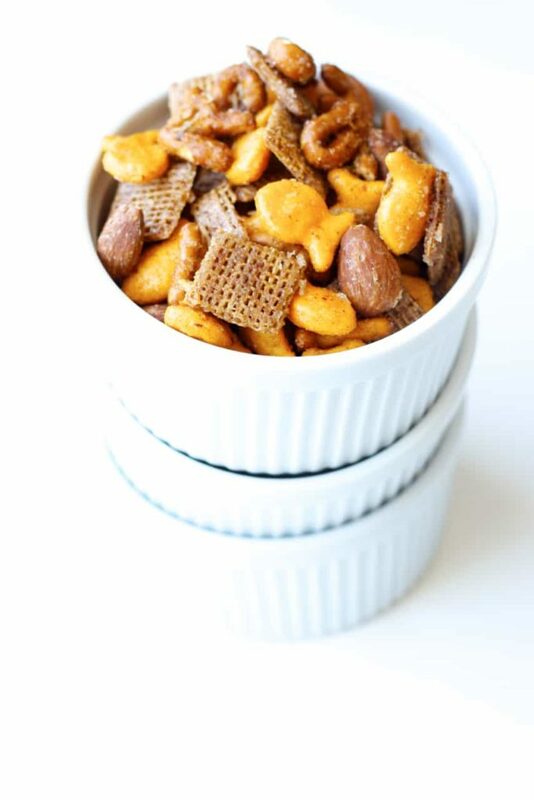 This sweet and spicy snack mix is quick and easy to mix up, and is absolutely addicting! Perfect to pack in a lunch, or just eat up straight off the pan! You know those snack mixes you can get, nuts and bolts or whatever they’re called? I don’t buy those often, but when I do they always disappear so quickly. I swear they must put something in those things that makes it impossible to stop eating them. I like snacking though, so having snacks on hand is a complete necessity in my house. And when they can be homemade? Even better. Now, I’ll admit this is not completely homemade. I did not make little goldfish crackers and shreddies cereal bits in order to get a snack mix. Obviously. That’s just crazy talk. I don’t have time for that. Spend 8 hours making a batch of goldfish crackers just to have them all gobbled up in 5 seconds? No thanks. I like making as much as I can from scratch, but I don’t drive myself crazy with it either. And sometimes you still want a tasty snack mix. The beauty of this mix is that you can use whatever “mix” ingredients you want. I used goldfish crackers, shreddies cereal, whole almonds, and some mini alphabet pretzels. But that can be changed to whatever you like. Use just pretzels if you want, more nuts, no nuts, different crackers or cereals. Whatever. The sweet and spicy coating on it is what makes it amazing. You can’t go wrong with sweet and spicy in my opinion. Of course, my kids don’t totally agree with that. They thought this was a little too spicy. I thought it needed a little more heat. So feel free to adjust the amount of cayenne to your preference. I promised the kiddos that I’d make it plain old sweet next time, no spicy at all, but I kind of feel that might be a little boring. Oh well, I suppose I could make two batches, sweet and spicy for the adults and just plain sweet for the kids. But I’m suspecting that they actually liked the hint of spice just fine. Or this is just as addictive as the store-bought variety. Because it was gone awfully fast, and I didn’t eat very much of it! Perfect to snack on, or to pack in a lunch. Plus, it’s quick and easy to whip up. Can’t ask for more than that! 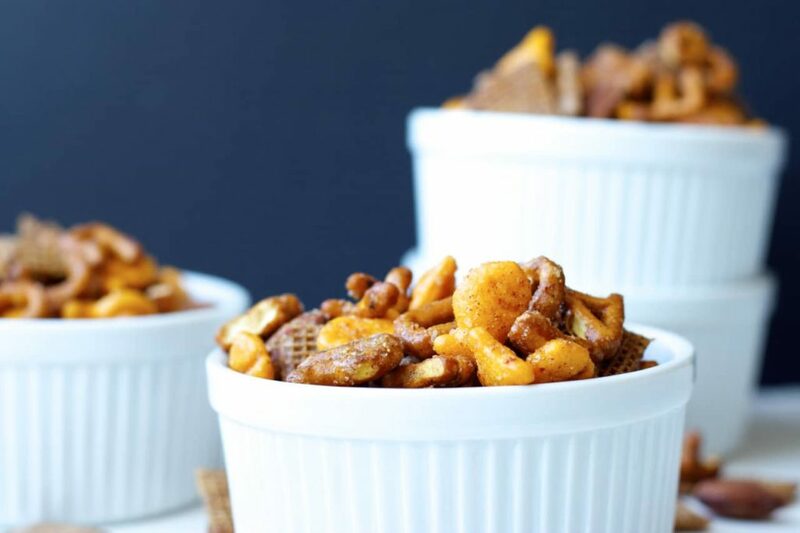 I also shared the sweet and spicy snack mix recipe over at Food Fanatic. Good lord, do I ever love snack mix. I'm afraid to make this because I will seriously not be able to stop eating it. But you have made it VERY hard to resist! Hahaha, yeah. Snack mix is dangerous that way! Thanks Mir! Love anything sweet and spicy! This snack mix looks fantastic! So addictive and delicious! Thanks Kelly - it's totally addictive! Oh my gosh I never knew you could make your own spicy snack mix. Why did I not think of this? My hubby and I eat those pre-bought ones by the gallons. I can wait to make my very own. This looks wonderful Stacey!! Pinned! This is my kind of snack! Looks delicious! My kids are constantly hungry too, we go through SO much snack food! Just make it a little extra spicy and you won't even have to hide it! :) Thanks Ashlyn! My kids are obsessed with snack mixes, can't wait to try your version! Thanks Sara! Hope you like it! My husband used to buy giant tins of the snack mix from Costco and we would blow through it so fast! This looks addicting! It's so easy to do hey? At least with homemade you can make a smaller batch! :) Thanks Ashley! 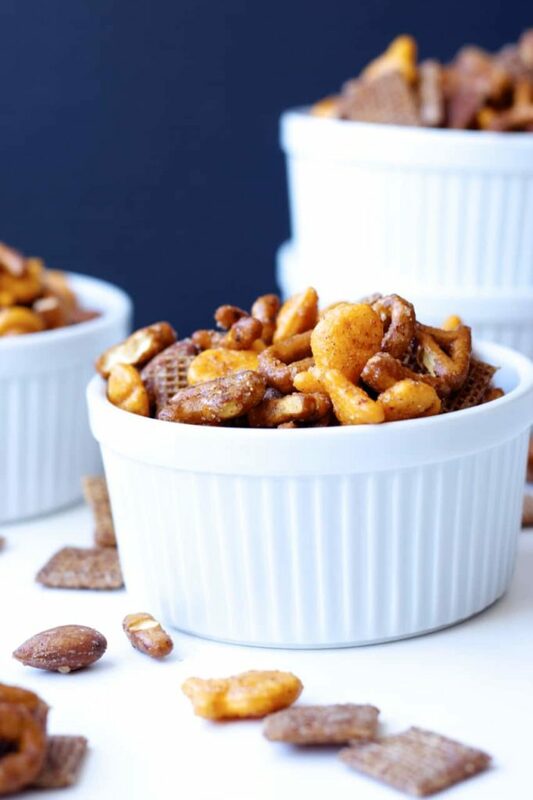 Love the combination of sweet and spicy in this snack mix. I am sure it is super addicting! Sweet and spicy is such a great combo right? Thanks Kelley! I have zero self control with snack mixes like this! I am loving this sweet and spicy version! Aaah that snack mix is so addictive, isn't it? The last time my husband brought it home we demolished the entire bag :/ This looks so delicious, and I love that you added goldfish crackers...so cute! The kids DO love those goldfish - and let's be honest, they're pretty tasty! :) Thanks Denise! This looks like a fun weekend project for the kids! Perfect recipe for kids to make, it's so easy! Thanks Cali! I will be making this pronto, maybe even today. Snack mixes are one of my very many guilty pleasures! Thanks Jacqueline! Hope you like it!